Looking for your BSI fix as you wait for the latest episode in the From the Files of the BSI series? In coming months Camel Press will be releasing several novellas featuring standalone episodes in the history of the Bureau of Supernatural Investigation. 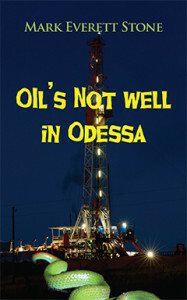 The first is “Oil’s Not Well in Odessa.” These will eventually be published in one volume, but for now they are only available on Amazon at the low cost of $.99. A year or two after the end of World War II, decorated hero Murph is adrift in Odessa, Texas, plagued by nightmares of the battlefield as he drums up the courage to tell a buddy’s wife about her husband’s death. At a diner he overhears two roughnecks discussing the evil that haunts their oil rig. Having witnessed horrors beyond human understanding in Germany, he believes the men’s fears are well-founded and sets out to investigate. At the McLean Rig he meets Laney, an agent for a secret branch of the U.S. government, The BSI (Bureau of Supernatural Investigation). Laney’s colleagues are trapped in the caverns below the rig and there’s no time to wait for backup. Laney tries to warn Murph away but in the end has no choice but to accept his offer of help. The beings Murph encounters below the surface of the earth will test the limits of his courage, imagination, and sanity. “Oil’s Not Well in Odessa” is the first novelette in the “From the Files of the BSI” series, which to date includes three full-length novels. A fourth, Chicago, The Windigo City, will be released in January of 2014.